i don’t have multiple tidbits for you, just the one! it’s been tough for me to rally this january. lots of meals cooked, babies snuggled, piles of paper sorted, laundry folded, friends seen and hours slept. things i didn’t have much time to do during october, november and december. 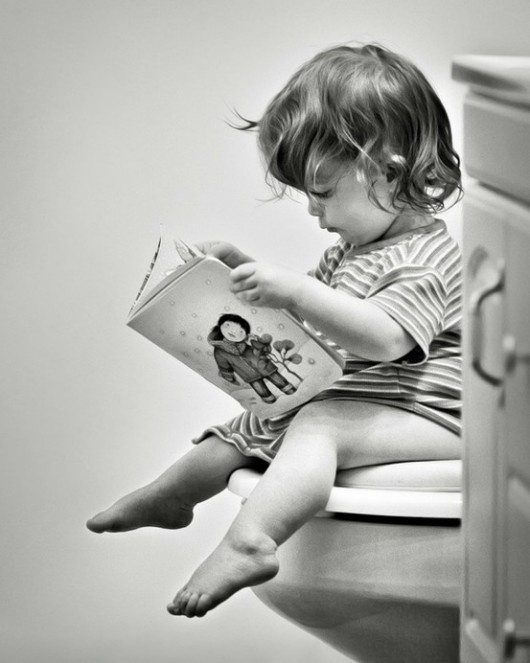 it has been so very nice to just catch up on life! we have been cooking A LOT. it’s great to be back in the kitchen. i go through phases where i really love cooking, do it all the time, and then two weeks later we’re living off of tubs of chicken salad from zoe’s kitchen and having breakfast for dinner again. rush really really really loves helping me in the kitchen, so i’ve been trying to throw him a bone and bake things so that he can participate. i mean, cooking and kids don’t really mix…hot pans, open flames, spattering oil…no. so we bake, which is much more tame. the trouble with baking things is that oftentimes, they involve lots of refined sugar and/or refined white flour. i’ll delve more into this soon with a post on our paleo-ISH (big emphasis on ISH) diet, but i try to avoid both, and if i can’t avoid both, i definitely try to avoid one. i found a recipe for cookies sweetened with honey (and some other additives), split the flour measurement with whole wheat flour, and i think all parties were happy. i wouldn’t call them healthy, but i would call them healthier. 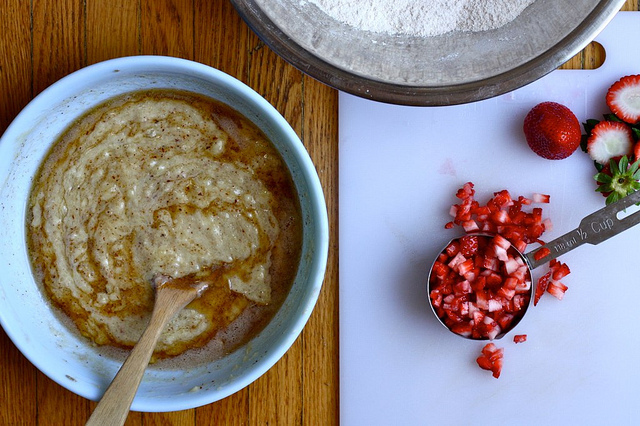 – combine all dry ingredients in a big bowl. 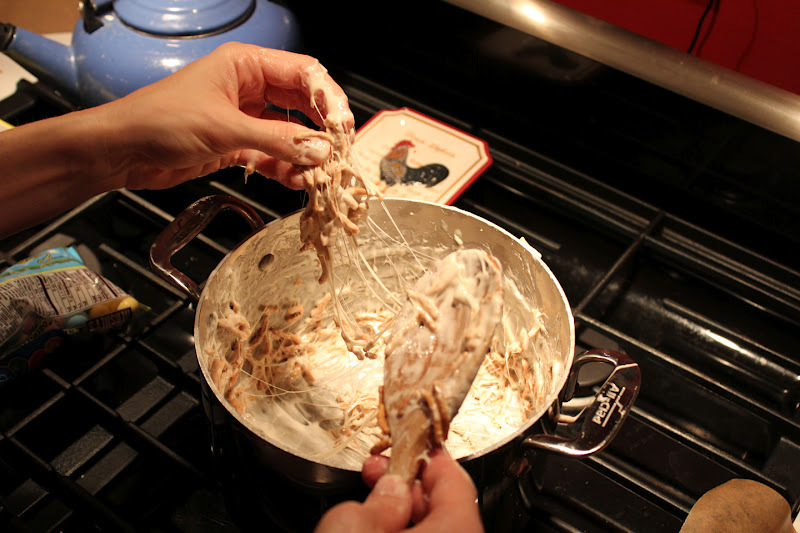 combine wet ingredients (butter, honey, vanilla) in a separate bowl and then add to the dry ingredients. stir until just fully incorporated. cover and refrigerate for about 30 minutes. meanwhile, preheat oven to 350 degrees and line a couple of sheet pans with parchment paper. 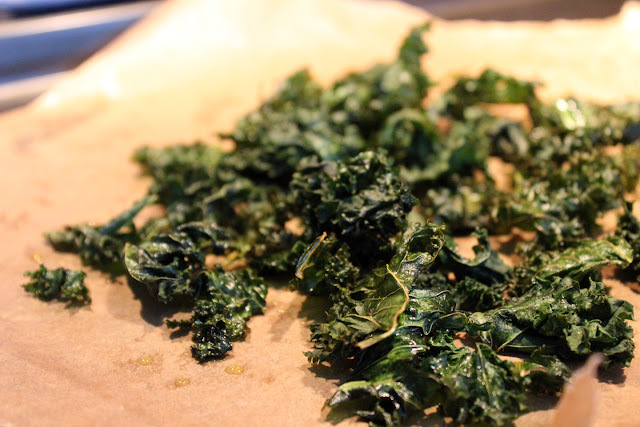 roll the cookies into balls and stagger on baking sheets. bake for 12-15 minutes or until golden brown around the edges. also, if your little one likes to cook, rush and i did a mommy & me cooking class (it’s called “kindercooks,” for 3-5 year olds) at the young chefs academy this week. 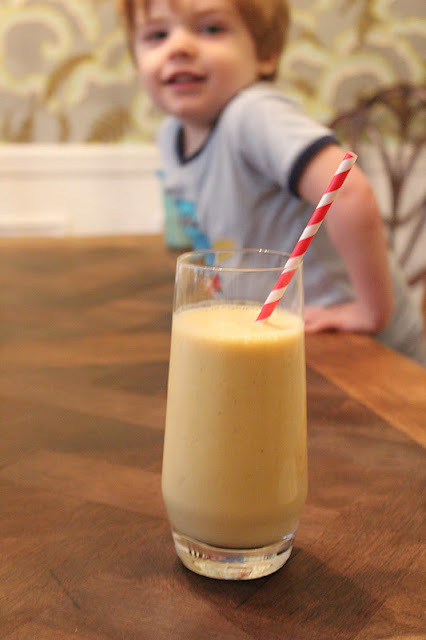 we did it with several of his little friends and it was a big hit! just so you know – i might not put out any thursday tidbits on thursday for the rest of the year. ok, i feel better that you know that now so your expectation level can be tempered. and there’s the visits from the UPS people. oh goodness, they are always bringing me envelopes, cardstock, liner paper and more envelopes. yesterday one of my regular guys was about to come up and ring my doorbell during naptime, so i thought i would just open the door and greet him instead. i asked if he was crazy busy this time of year, and he said yeah…we’re working really long days and this is the time of year they can’t even hide how much money they’re making (made mental note: in next lifetime, invest in shipping business). so i told him that i appreciate all that he does, i know he works hard, thank you! he stopped on my front steps as he was walking back to the truck, turned around to look me in the eye and said – “no, no — thank YOU. without you, there’s no me. so i’ll keep working hard for you. happy holidays!” then i started to tear up so i had to go back inside. humanity. it’ll get you. in other non-holiday-card related news, i’ve been cooking a little bit. normally this time of year i would be brandishing every take out menu available, but we watched forks over knives last weekend and it inspired me to cook more healthy, fresh foods for my family. so i’ve been trying to plan ahead for the week’s meals and get organized. things run SO much more smoothly around here when i do a little forethought and one big grocery store run at the beginning of the week. sometimes i think: is this how an organized, non-over-committed person’s life runs all the time? oooo. i see why this is a thing. 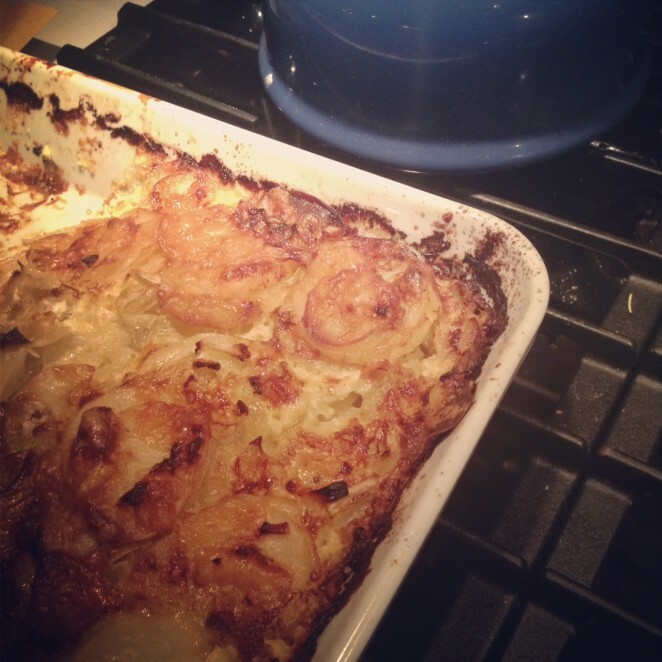 a side i made recently – which really was chosen because i had some heavy whipping cream and gruyere cheese to use up from holiday cooking, not for its healthfulness – is the barefoot contessa’s potato and fennel gratin. OMG. do you SEE how wonderfully crispy it is?! it was divine. n.b., it needs an hour and 1/2 to cook… we ended up eating a pretty late dinner this night! i stopped by the fresh market yesterday though, as i was out of half and half. and y’all, with the amount of coffee i’m downing right now, that simply cannot happen. 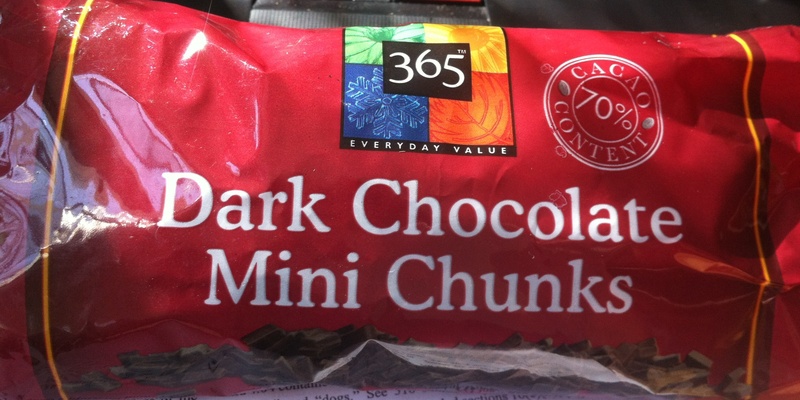 right next to the dairy products, i saw these and stopped because, well, there was my name. and i don’t see my name all that often. 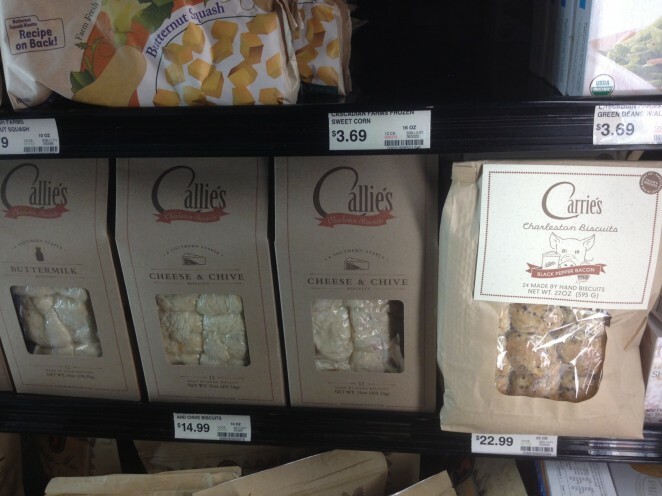 callie’s charleston biscuits! but…do you see “carrie’s charleston biscuits” on the right? this prompted all sorts of questions for me. namely because, when i was little and everyone was wearing barrettes with their name on them, they never ever had a “callie.” so, my mom bought the “carrie” barrettes and elongated the two “r”s to make callie. i absolutely loved them. but back to the biscuits, is that a typo? or did someone in packaging really screw up? did somebody think “oh her name can’t be callie, too weird – gotta be carrie. i’m gonna go with that and hit print on these here labels.” or is there a carrie, a right hand gal to the master biscuit maker, callie? so many questions… and let’s not forget the question – are people really paying in excess of a 20 spot for frozen biscuits? we had an extra passenger in the car yesterday. our really sweet thoughtful neighbors’ son was outgrowing his toy dinosaurs, so they brought them over to our house… and included in the bunch was this gory, bloody-toothed, savage tyrannosaurus rex. thanks neighbors! rush seems to love him for what’s on the inside. rinne is on that 2nd child path to learning how to entertain herself… she’s learned how to climb on the time out (rocking) chair and rock herself. it tickles me so much to see her trying to get it going. 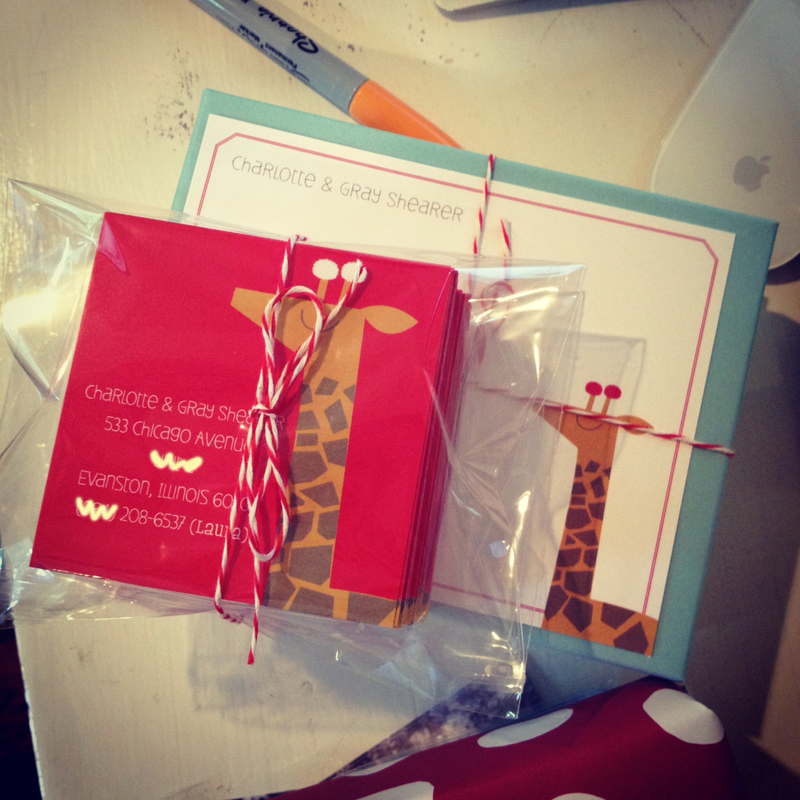 lastly, remember the favors we gave out at billie and rinne’s little shindig? well, i think they need to be available for big people too. 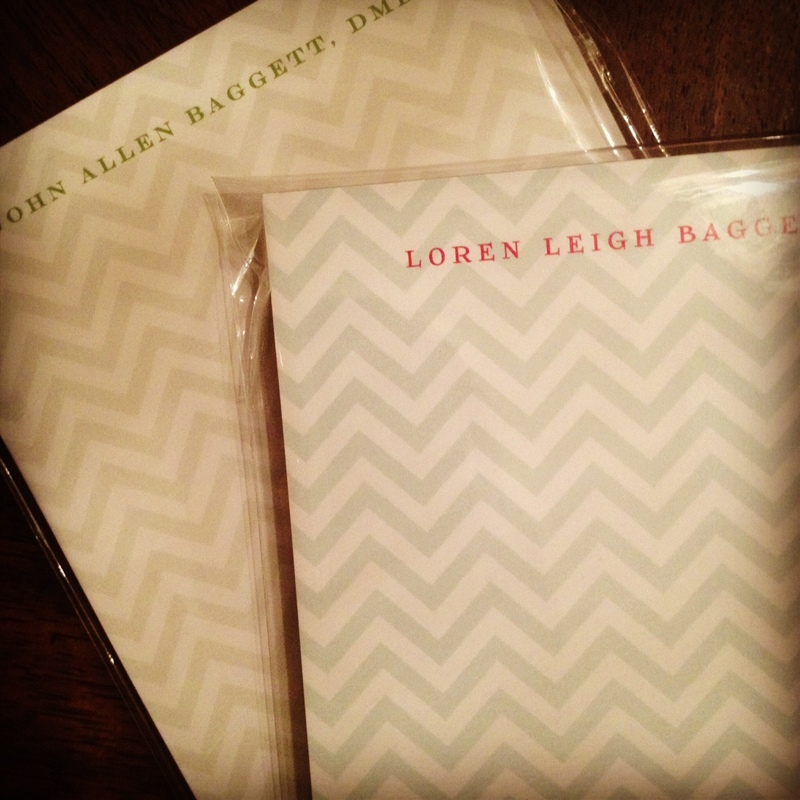 so i’m now making 50 sheet chevron notepads JUST in time for stockings that need to be stuffed! they make great gifts, as they are just $25/per pad. colors and fonts are customizable. email me (callie@calliespondence.com) if you’d like to place an order! these were for a client who wanted to make some for her husband to keep in his office (grey/green), and of course some for herself (aqua/red). FUN! and juggling all of these holiday card orders? i’ll do that any day of the week and twice on sunday. but watching my beloved bulldogs play on saturday against alabama FOR A BERTH IN THE NATIONAL CHAMPIONSHIP GAME?! my stomach is tied in knots just thinking about it, and i know i’ll be a mess actually watching it. since i started college (1998) and kind of cared about college football, we’ve never made it this far. heck, the last year we won the national title was the year i was born…hrm. so this is a BIG DAMN DEAL. i try not to get my hopes up, but how can you not? 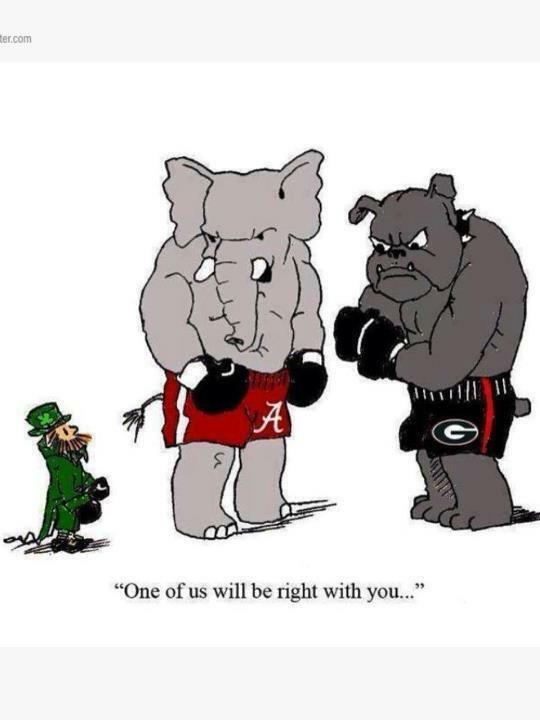 i have faith in my dawgs. so. 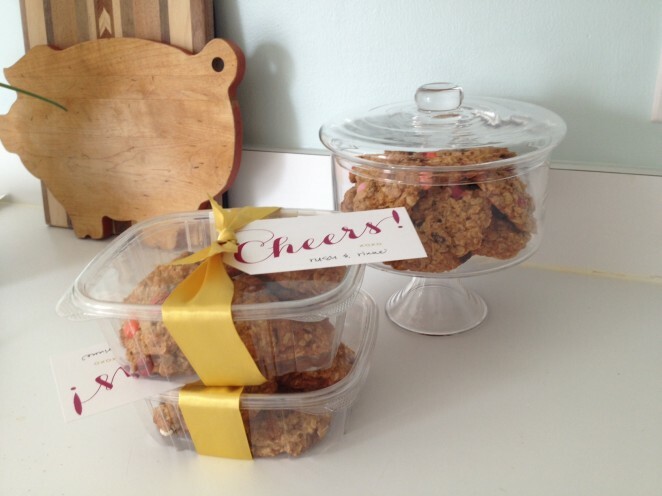 i signed up to bring the treat for rush’s preschool class party yesterday. what do we do first in this day and age, when faced with such a task? why, head to pinterest and search whatever you are looking for, only to find a bevy of suitable options. i found an adorable idea and set out to make it. 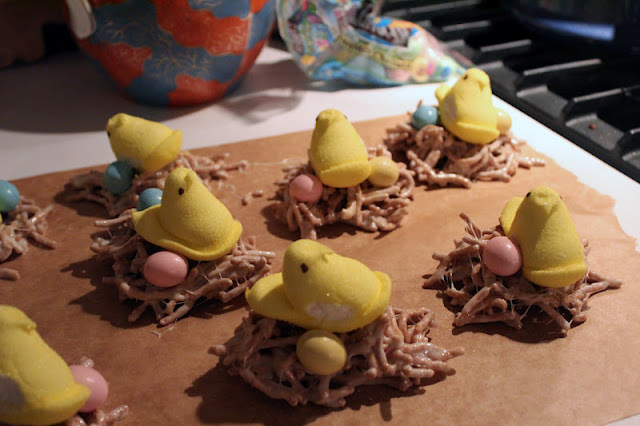 i would make these little bird nests with a cute peep and a few chocolate eggs too. done! i go about making this little recipe…it seems pretty simple. 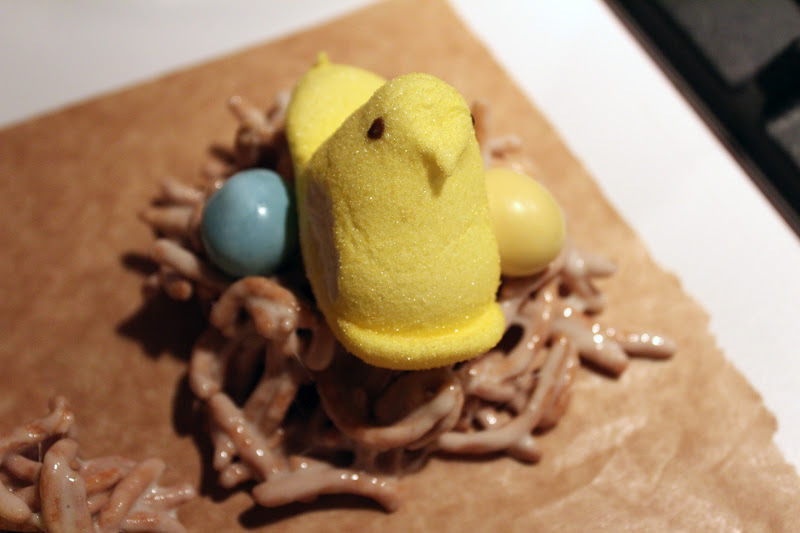 melt the butter and marshmallows together, then stir in chow mein noodles and meld them into little nests, let cool, and then add the nest inhabitants. i love how the recipe casually says, “oh yeah, coat your hands with cooking spray or shortening so they don’t stick to the mixture” – i did that and it worked for the first three seconds (generous estimate) i had my hands in that pot. here’s what it looked like the rest of the time … on my fresh birthday manicure … !! i don’t think that picture even begins to show the intricacies of these spiderwebs i was dealing with. i mean, i don’t know if i did something wrong or what, but the concoction in my pot was superglue. i could only manage to drop a few lumps of the stuff – no nest melding going on – onto parchment paper and then rbb came in behind me and quickly pressed a peep onto it. i could barely even get my hands off of one to move onto the next!!! what the HECK?!?!?!!? i’m getting all hot and bothered remembering how frustrating it was. anyway. they turned out cute i suppose. except the poor preschoolers could not break apart the CEMENTED together chow mein noodles…so they had to be broken up by kind teachers and parents. sign. it’s fashion over function for me even in the preschool treats arena. i’ll never learn. did i scare you with that boo? if not, these cupcakes definitely will. the spider wrappers are major spooky. so i promise i’m not turning this into a food blog, but man – something about fall just makes me want to put on an apron, get the stand mixer going and BAKE. i made real simple’s pumpkin cupcakes with cream cheese frosting the other night and golly gee, are they good. 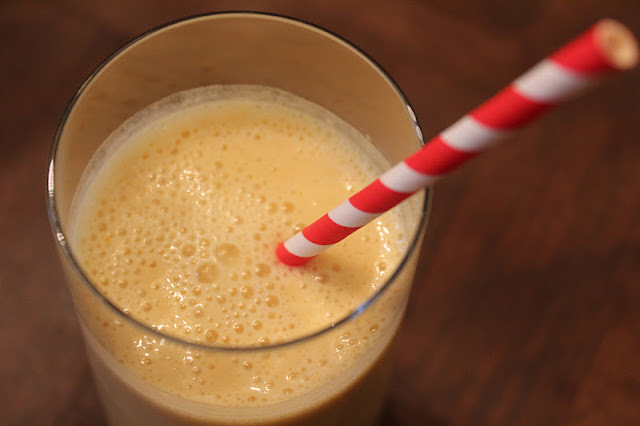 i followed the recipe exactly, except instead of be lured into spending $5 on “pumpkin pie spice” (pshaw – i’d rather spend $5 on a pumpkin spice latte! right?! ), i just added pinches of nutmeg, cinnamon, allspice and ginger. oh and clearly i opted for black sprinkles that i had on hand instead of candy corn toppings. oh and made them miniature. now here is what’s really frightening….the reason i made them? because i am one of the (don’t laugh) room moms for rush’s preschool class, and we had a class picnic yesterday. i went for a walk with one of my dear friends from college the other day and was telling her this, and she exclaimed, wow. we have really gotten old. i would have to agree…but the cupcakes sure were good. 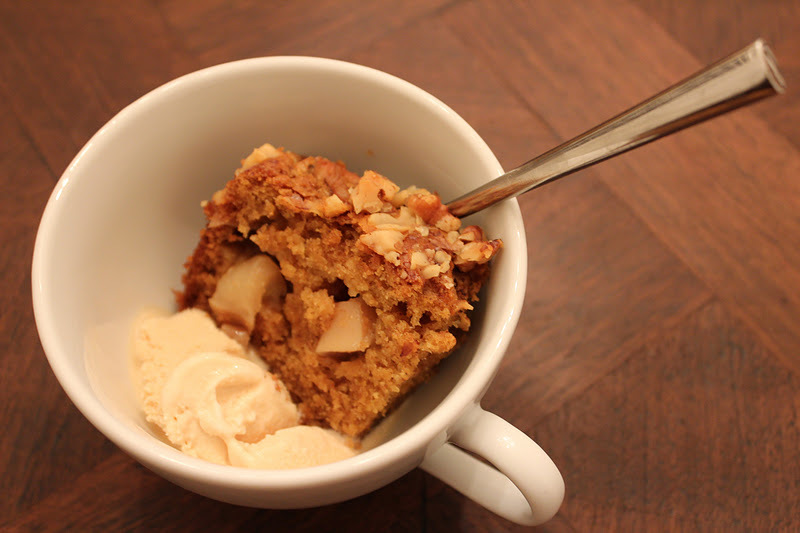 pumpkin apple bread, side of ice cream optional. every once in awhile, i find a recipe that is too good not to share with you all. 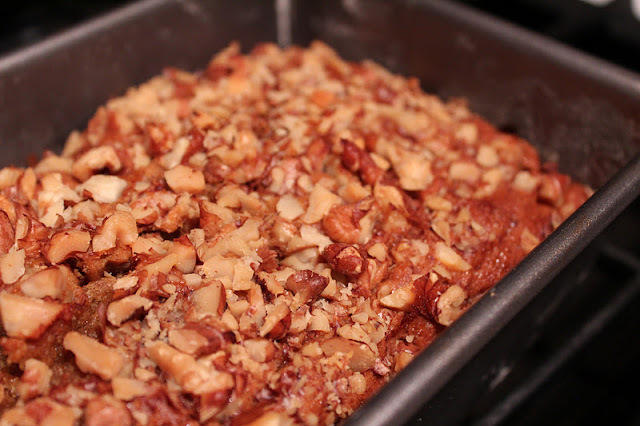 yesterday i made pumpkin apple bread with walnuts on top and it is soooo delish, i had to walk away from the loaf pan last night so there would be more than half left for today’s breakfast. i had never had pumpkin apple bread before, but saw it in the bakery at whole foods and thought…i should make that. so i found a suitable recipe online, tweaked it a bit and wah-la! 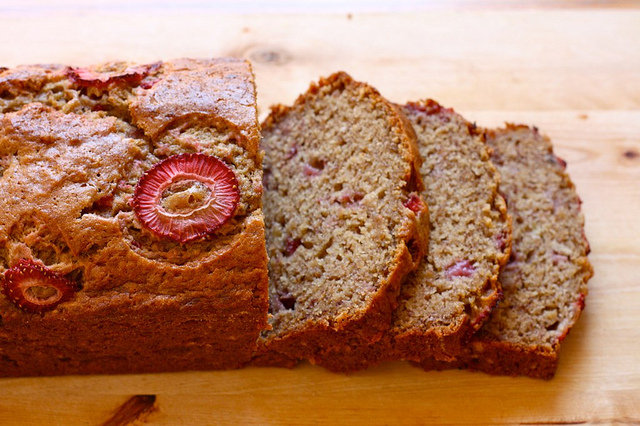 the best part is that it’s kind of healthy, which i categorize by the use of whole wheat flour, raw sugar and no butter. err, one measly tablespoon of the yellow nectar as opposed to the usual two sticks. might as well be none. and to that i say, why not make it a smidge less healthy with the addition of some caramel sea salt ice cream on the side? that’s what i’m talkin’ about. preheat oven to 350 and butter/flour a loaf pan. in a bowl, place the flours, sugar, baking soda, salt and spices. mix thoroughly. in a separate bowl, whisk together the pumpkin, oil, milk, vanilla and vinegar. make a well with the dry ingredients and add the wet to the middle. mix very gently until all is incorporated. fold in sauteed apples and pour into prepared pan. sprinkle with walnuts. bake for 50-60 minutes until a cake tester (i always use a fork or knife…do you think people own devices solely for cake testing? i’ve always wondered that when reading recipes.) comes out clean. i don’t know about y’all but i usually have a whole mess of overripe bananas in my fruit basket. i always get a bundle but then they compete with the great summertime fruits like blueberries, kiwi, strawberries, peaches…and sort of fall to the bottom of the snack list. so, i am forever on the lookout for new past-their-prime banana recipes! 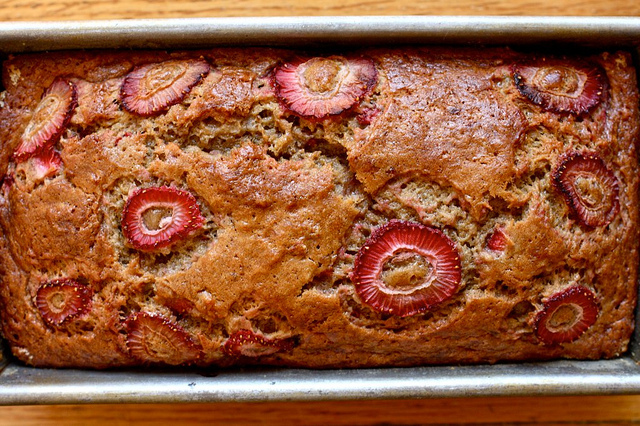 and joy the baker suited me up with a fabulous new one…brown butter banana strawberry bread. YUM. see the brown butter on the left? 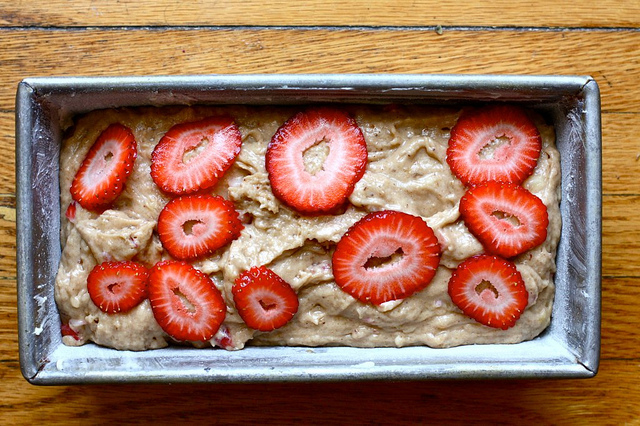 that’s what makes it so much more delicious than your normal banana bread (not that that’s not delicious – i’m not insulting your banana bread recipe. just something new and fun to try!). oh, and the recipe calls for 2 cups of all-purpose flour. 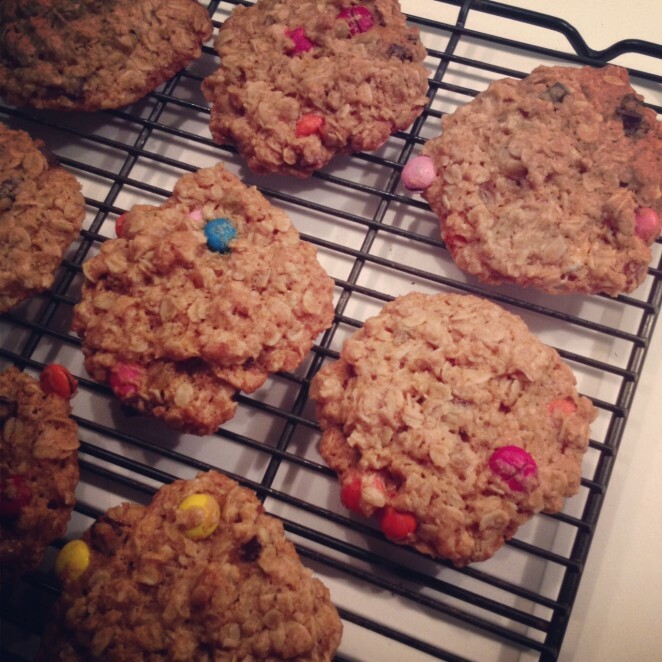 i used 1 cup of all-purpose flour and 1 cup of whole-wheat flour…you’ll never know the difference. i thought about taking my own pictures for you all…but decided that joy had done such a fine job, how could i really improve upon it. all photos courtesy of joy the baker. 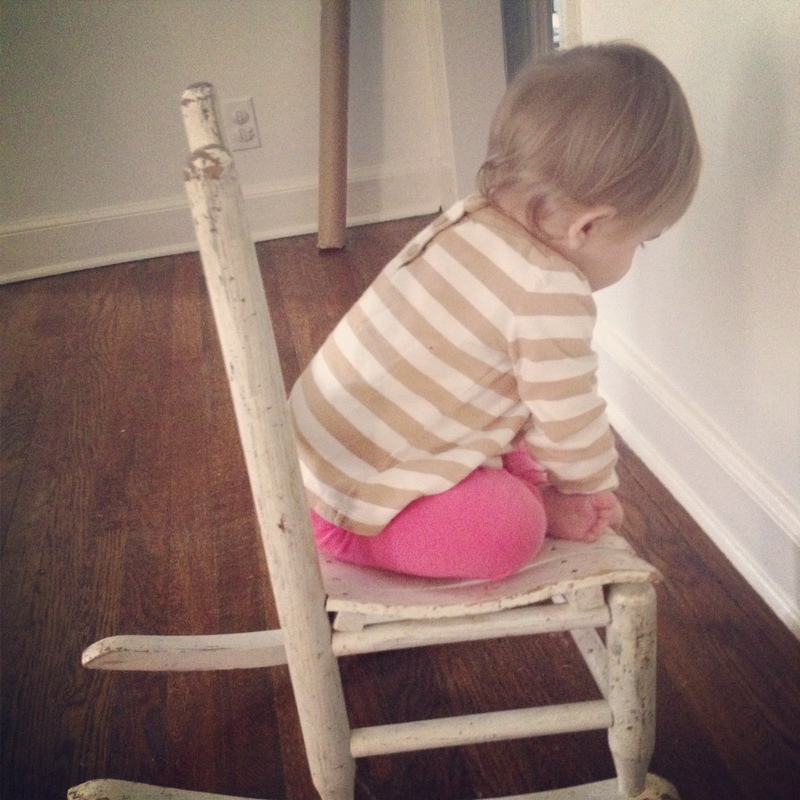 i’m keeping this one around for future brown ‘nanas. she said it freezes beautifully too, which are the magic words these days! man, it’s been forever since we’ve done a giveaway! what is up with that?! no bueno. so i’m going to make this a good one…get ready. 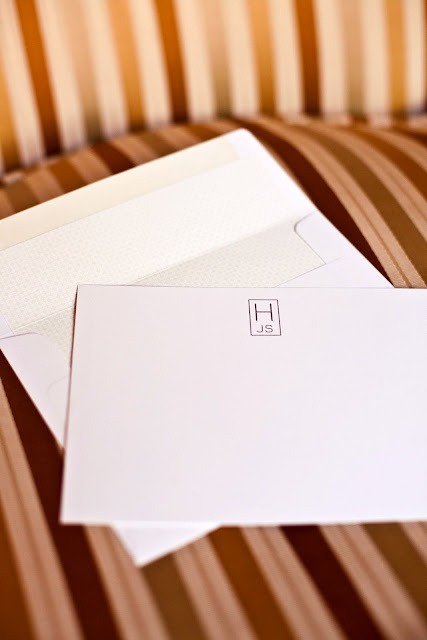 i’m going to give away a set of 50 ‘modern monogrammed’ notecards (from what i can tell, a crowd favorite) printed in thermography with lined envelopes, but of course. color of ink / envelopes is winner’s choice! what’s your favorite summer cocktail? or…mocktail, in my case. my answer: well, i have two. usually – a pimm’s cup always does me right. 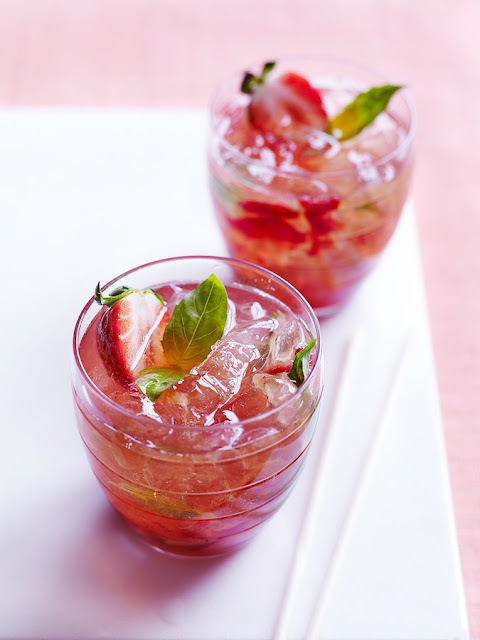 but this summer – strawberry-basil spritzer, minus the vodka. babies don’t like vodka i hear. still looks pretty tasty though?! 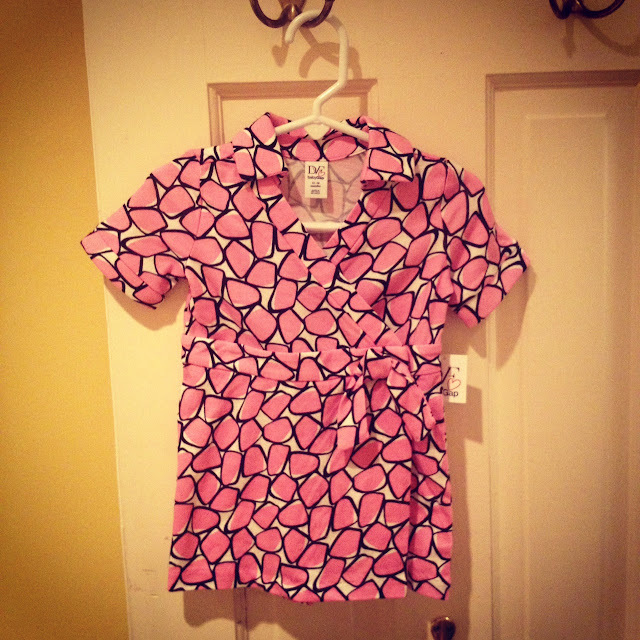 i will randomly pick the winner on sunday night for a monday announcement – so let’s hear whatcha got and GOOD LUCK! 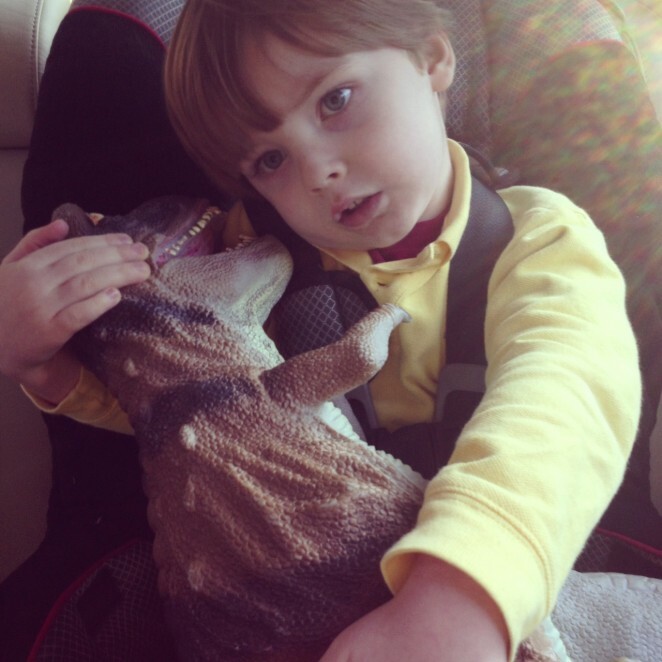 so…here is my fear of having only male offspring. 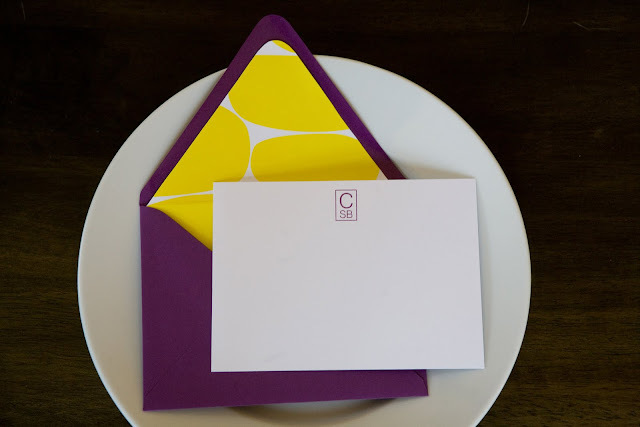 mother’s day / your birthday / insert any holiday that requires attention or a gift comes around, and there is no forethought, planning, mention, you get the idea…about the day. i have seen this with my own brothers and i have seen it with my husband’s family, him coming from a family of two boys. insert daughter or daughter-in-law to the rescue, with constant pestering, asking and sometimes telling “what are we doing for our / your mom for (most recent example) mother’s day?” the answer is always foggy at best. that’s where we found ourselves this past mother’s day – 2 p.m. ON THE DAY OF with no plans in sight to celebrate phyllis, my wonderfully spunky mother-in-law. 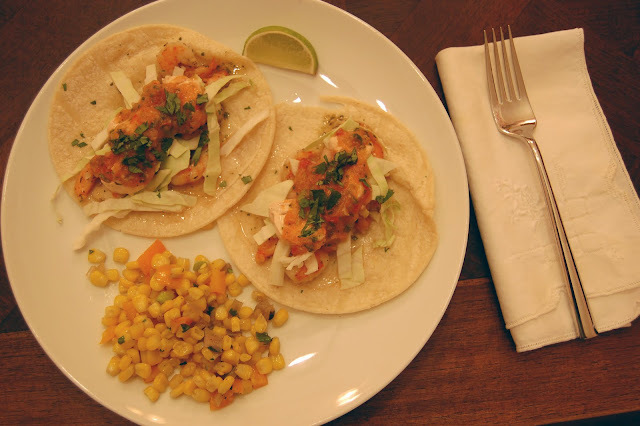 now – nothing fancy but all quick and great for a family dinner on a warm may night. 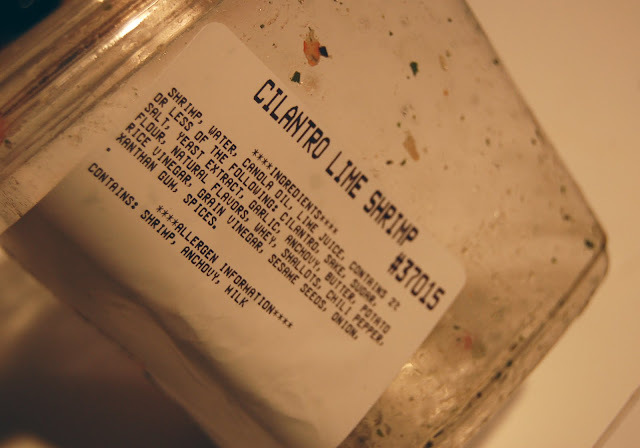 so i scurried off to the store to pick up the necessities – some of this was fortuitous, as i had been at costco the day before and happened to pick up a carton of their ‘cilantro lime shrimp’ (already cooked, already sauced up – perfect) that i was planning to use for another dinner, but this would work even better! rush earned fifty gold stars for taking a 3.5 hour nap AND playing quietly in his crib for another HOUR (unprecedented), allowing me to get everything going in the kitchen. first up – the salsa. now i know most of you out there would think i had gone off the reservation for making my own, but i just don’t really like any of the store-bought ones and i also happened to pick up a couple of pounds of ripe heirloom tomatoes at whole foods (they were on sale) to use for…something. enter, homemade salsa. fantastic! 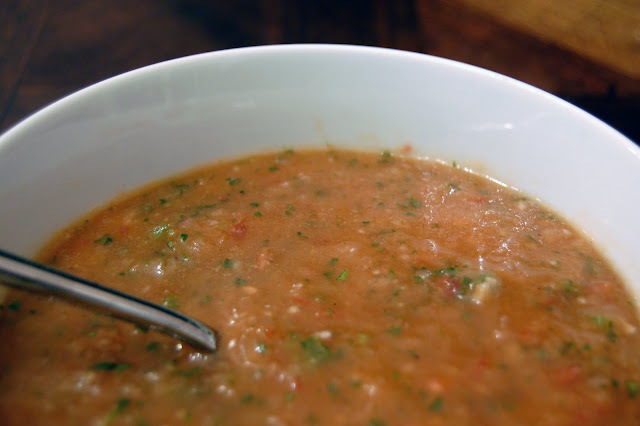 i quickly went to foodnetwork.com and searched “heirloom tomato salsa” – popped right up. i tweaked the recipe a bit, but everyone went ga ga for it and wanted to make sure i would not lose the recipe. place all ingredients into a food processor, and pulse until desired consistency (i like mine pretty finely pureed). add salt and pepper to taste. this made a GALLON (no joke) of salsa…but five adults went through all but maybe a quart. it was delish and took me almost no time to prepare. guacamole – i think everyone has their own guacamole method, but here’s mine. i just wing it, but this is about what i do. mash avocados with a fork. add all other ingredients and stir gently. add salt and pepper to taste. no picture of the guac; it was gobbled up by the time i got my blogging druthers about me and thought i should document some of this. so i got the salsa and the guac done, put big heaping portions in two bowls, set them on a platter with lots of blue corn chips inbetween and the starter was finito. 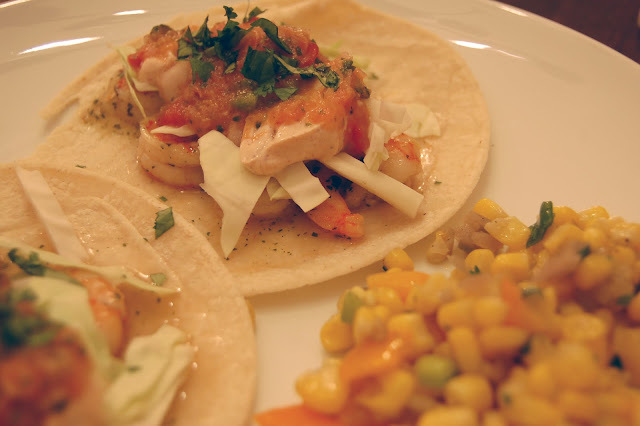 shrimp tacos – my plan was to heat up the shrimp right before we ate, but get all of the toppings ready…so i put each of the following things in small bowls and had them ready to go. 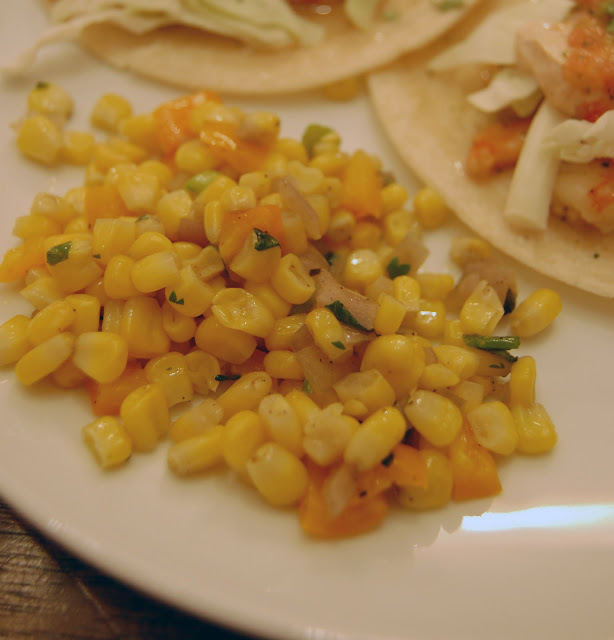 confetti corn – recipe from ina (found in the green back to basics cookbook). i got this started before the guests arrived – sauteed the onion and bell pepper, then left it sitting on the stove so i could add the corn right before we ate and it would be hot. 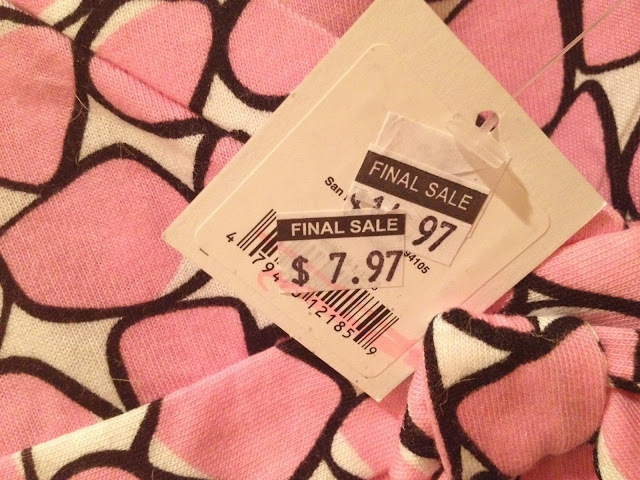 ….and i was pretty much done! once the guests arrived, i heated up a big stack of small tortillas in the microwave, added the corn to the saute pan, dumped that dish into a bowl and then put the shrimp into the same pan to heat those up for just a couple of minutes…and dinner was served. side note: the vintage white napkins? procured at an estate sale for 50 cents apiece. i have a set of 6 and looooovvvvve them. dessert was uber easy – chopped up fresh strawberries and served them with guest’s choice of vanilla ice cream or cream cheese fruit dip on top. the moral of the story is: be sure to have a daughter. no really, a simple menu makes for a quick dinner party, but sometimes simpler is better? everyone raved about the food (they were probably lying but it was still nice to hear) and i almost felt bad for taking credit because it was so easy and involved little, if any, cooking. i was so pleasantly surprised that this came together so easily and we were able to make my mother-in-law feel special!